Explore your creativity, without fear of judgment, using simple art media and experience the benefits of art journaling as a creative self-care tool. An introduction to art journalling for anyone who would like to incorporate images as well as words into a journal to reflect on their thoughts, feelings and memories - no special artistic talent or experience is required. Everyone goes about art journalling in their own way and develops their own style. The workshop will set you on a path to daily creativity in your art journal, which will be a space where you can feel free, have fun exploring and experimenting with art media without rules. Your journal can also be a place for creative "self-care" and a tool for self-exploration where you can reflect on your thoughts, feelings and memories. In a safe and nurturing environment, you’ll be led through various processes to encourage a spontaneous and intuitive approach to working in the journal with opportunities for some personal reflection. You’ll also be shown examples of different approaches to inspire your own work. Using a variety of different media (e.g. 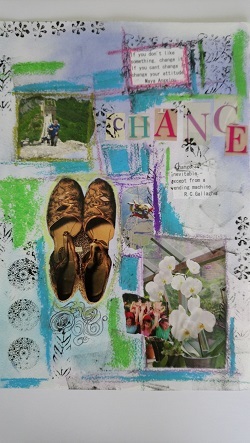 pastels, watercolour, collage) and techniques, you’ll be shown how to achieve different effects in your own journal with time for experimentation. Art materials provided but bring an A4 visual diary. A list of other things you may like to bring (optional) will be sent out separately when course numbers are confirmed.